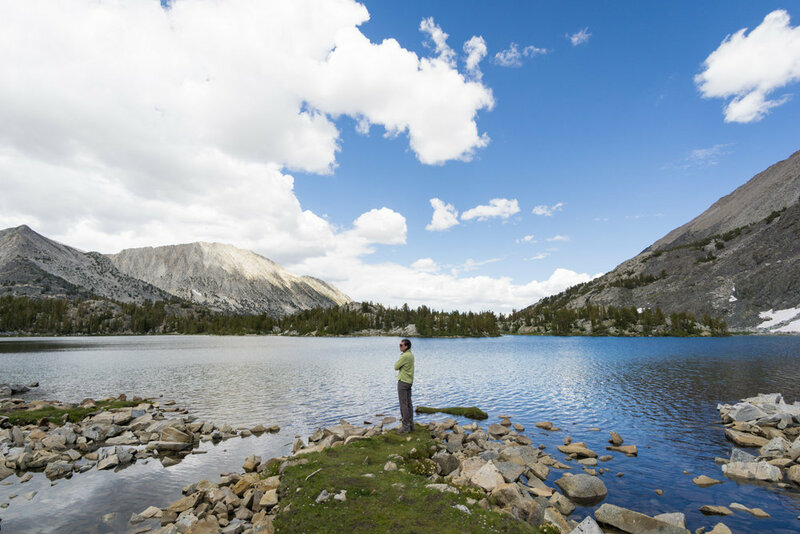 A very popular trail (and for good reason), Little Lakes Valley is a must visit for any mountain or alpine lake lover. 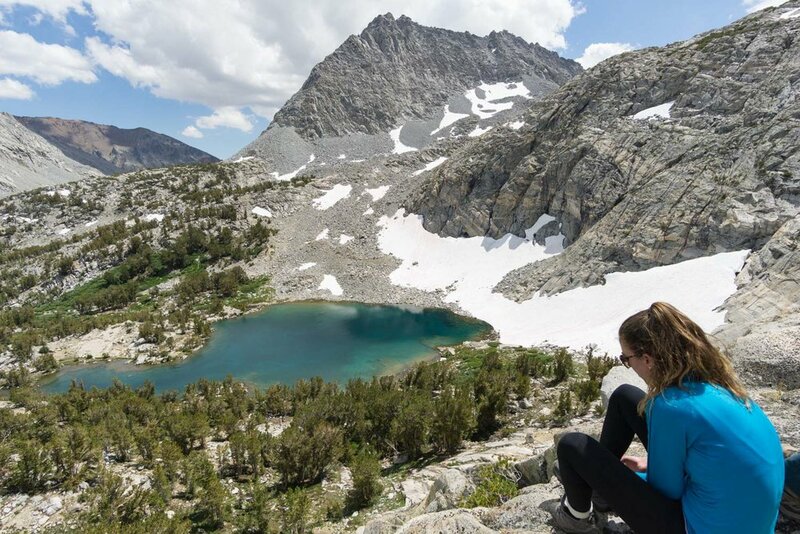 The high elevation start combined with the flat trail spanning no less than 6 spectacular lakes in less than 5 miles makes for a leisurely hike with some of the best views in the area. Only another mile longer, the side trip up to the four Treasure Lakes would also be a great way to escape the throng of dayhikers. Bug Spray is a must here... they don't call it Mosquito Flats trailhead for nothing! Trust me, you'll be able to enjoy the scenery much more if you have it. 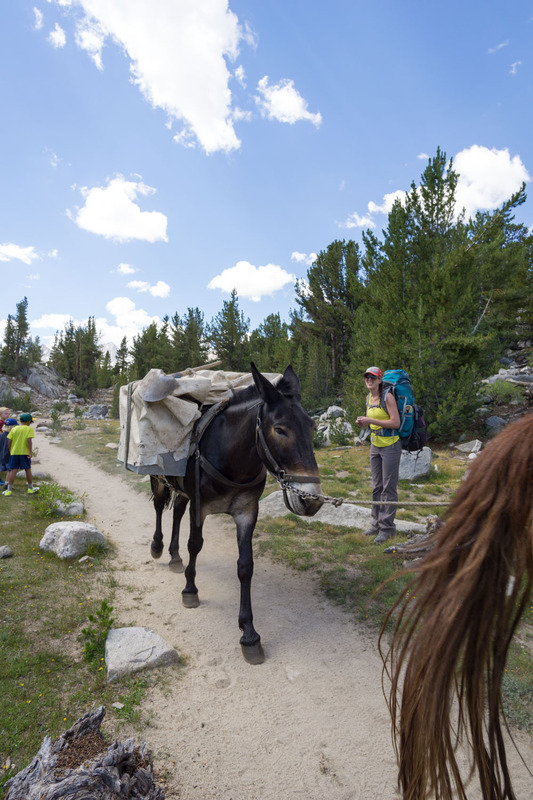 Mosquito Flats, the trailhead for the start of this hike, is about a 20 minute drive off the Highway 395. Very popular with day hikers, the earlier in the day you get there, the closer you'll be able to park to the actual start of the trail instead of parking in the series of overflow lots. Note - there are bathrooms, trash cans, and bear lockers at the trailhead to store any food during your hike so you don't attract any bears to your car. 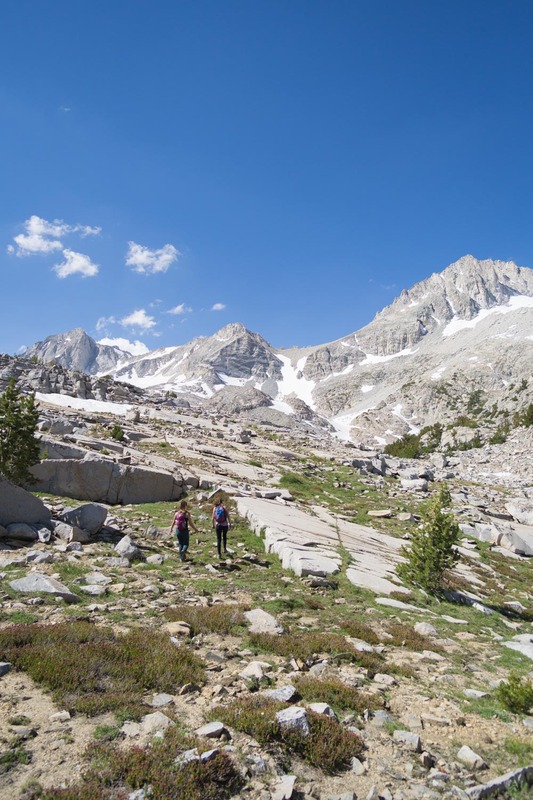 Sitting at 10,215 ft, Mosquito Flats is one of the highest trailheads in the Sierras! Since we were starting so high already, there was not too much elevation to climb, making this trail a great destination for families and children. After about 0.6 miles near Mack Lake, we passed the junction for Mono Pass on our right, which also heads to Ruby Lake. Right away you are treated to spectacular views of mountains in the distance and lots of colorful wildflowers on the side of the trail. Mack Lake - our first lake of the trip! We then passed Marsh (10,412 ft) and Heart Lake (10,415 ft), all within less than a mile and a half from the start of the trail. We rock hopped several times across the river, and each stunning lake we passed had a perfect view of the surrounding snow-capped mountains. After Heart Lake, we reached Box Lake at 1.8 miles from the TH. This lake view was my favorite in the area with its rich blue color, lots of large rocks near the shoreline, and a great vantage point of the nearby meadow and mountains. Box Lake also seemed pretty popular with fishermen, as the lake seemed to run a little deeper than the others. 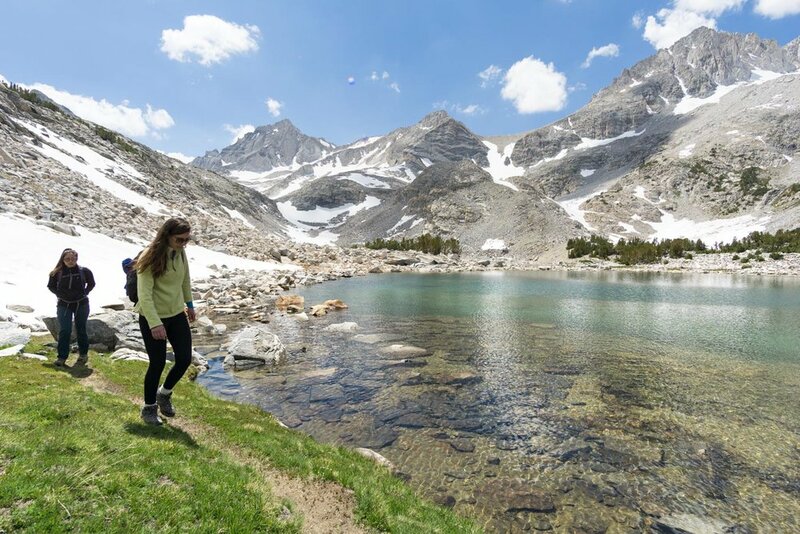 Another half a mile further, Long Lake (10,560 ft) is one of the largest in the valley, and the trail follows directly along the rocky eastern shore. So hard to take a bad picture along this route with such a picturesque view ahead! Tired of lakes yet? 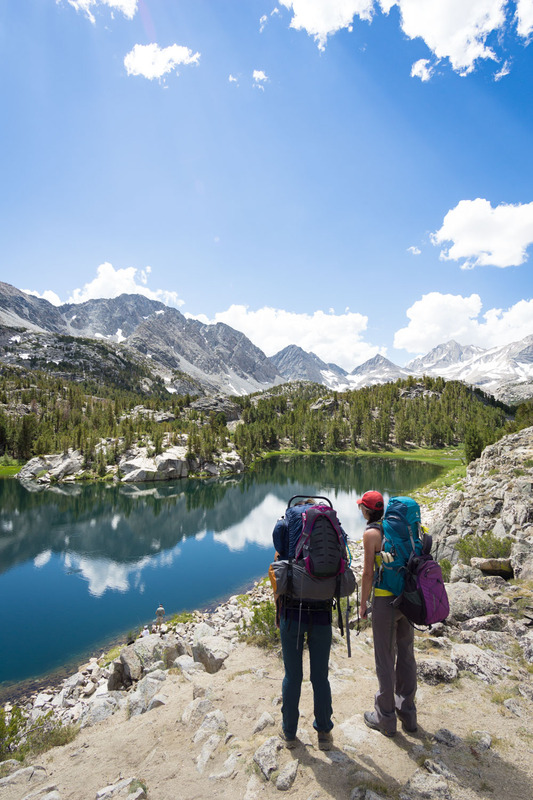 I'm pretty sure this one backpacking trip holds the record for the most number of alpine lakes visited in one trip. 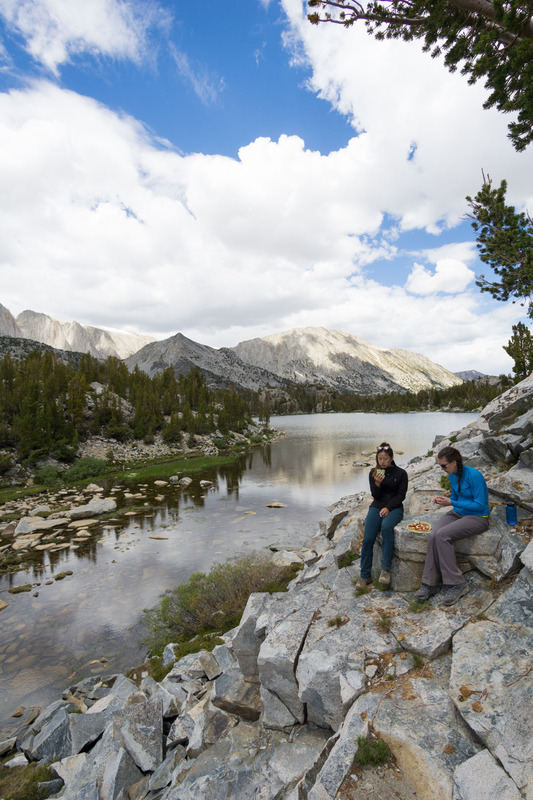 We decided to have lunch on one of the rocky peninsulas that juts out into Chickenfoot Lake (10,789 ft) and has an insane view of the surrounding meadows and mountains. The five peaks visible from our lunch spot from left to right were: Rosy Finch Peak, Pyramid Peak, Bear Creek Spire, Pip Squeak Spire, and Mt. Dade. The river that flows through the peaceful meadow was also intensely popular with fisherman, and this seemed to be the turn-around spot for most day hikers. However, we continued on to Gem Lakes (10,915 ft), only a mile further up the trail and 4.2 miles from the start of the hike. The largest of the three Gem Lakes had a brilliant aquamarine color and would be our home for the next 2 nights. 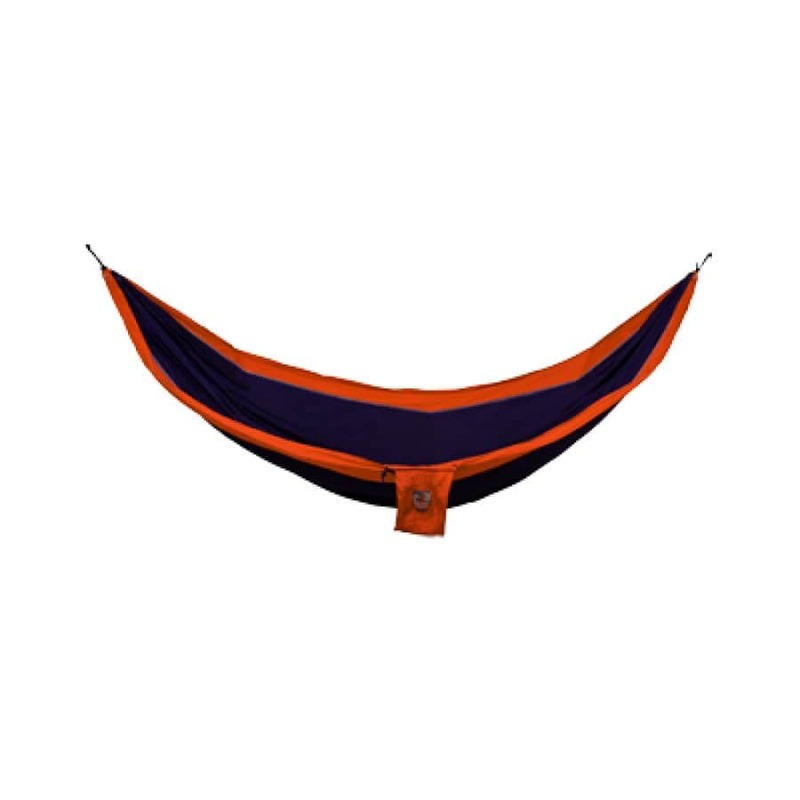 We set up our tent on a nice flat area and filled and hung up our Platypus water reservoir on a nearby tree. 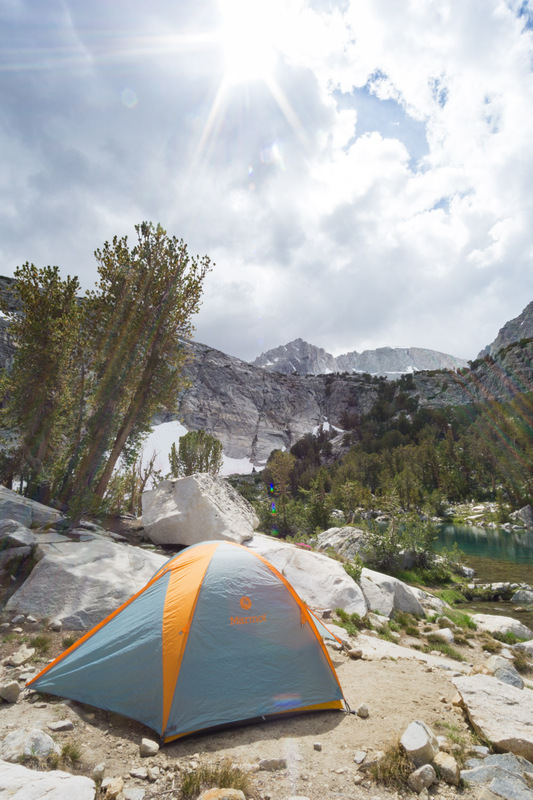 The rest of the day was spent relaxing near camp and exploring the nearby meadows and smaller Gem Lakes. Since the clouds were rolling in, we had an early night and woke up bright and early for a cross country excursion over the ridge to Treasure Lakes. We made our way around the larger Gem Lake and started scrambling and making switchbacks up the rocky ridge, turning around every so often to enjoy the view from the side of the cliff. Once we made it over the top, we stayed high on the hillside even though we spotted a small trail heading up the same way at the bottom of the valley. 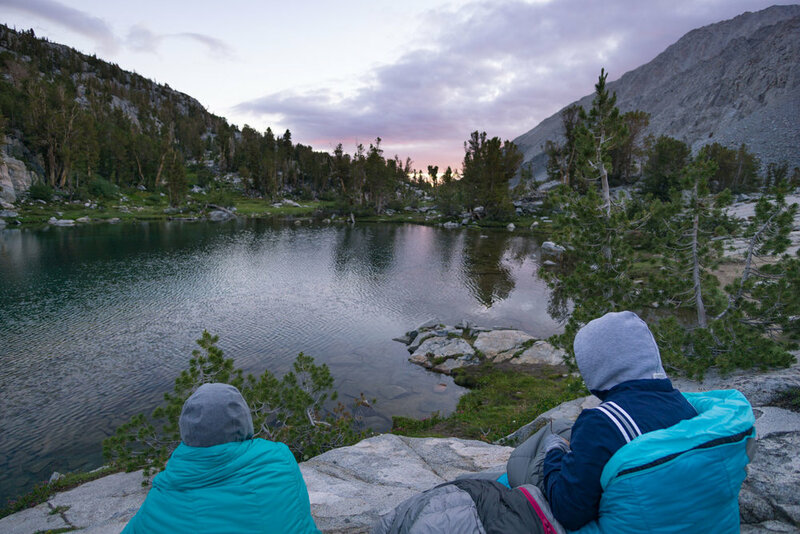 You could also easily reach Treasure Lakes without the scrambling by finding the Rock Creek outlet from either Chickenfoot or Long Lake and following it all the way up the valley to the lakes. We circled and explored all four Treasure Lakes, each with their own unique characteristics and views. I loved how exposed the entire basin was, and there was no shortage of rocky landscape views up here at 11,175 ft.
We lounged around the lakes all day, even mustering up the guts to jump in before heading back over the ridge to camp. When stopping on the top of the ridge to have lunch, we could spot Chickenfoot and Long Lake all the way in the distance, as well as the trail up Morgan Pass on the opposite of the valley. The next morning the hike out was super quick and easy with the majority of the trail being slightly downhill. The morning golden light lit up the mountains and cast a beautiful reflection in all of the lakes we passed. 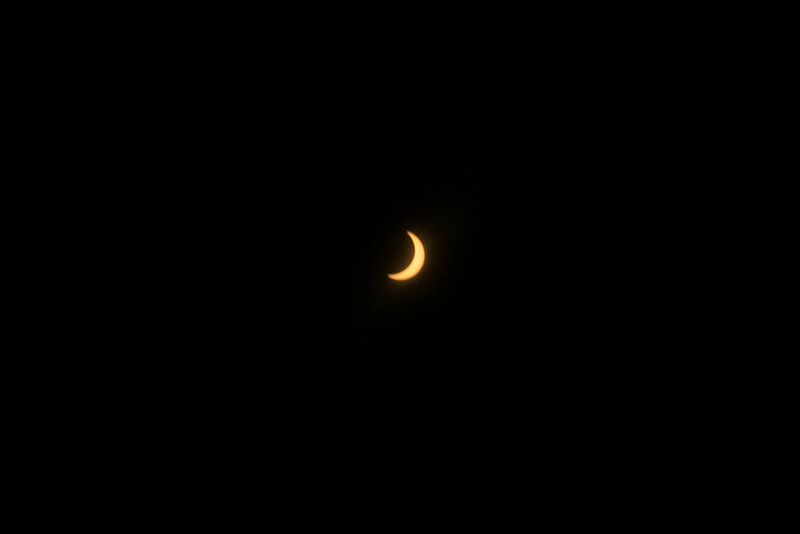 What made this trip extra special was getting to witness a true SOLAR ECLIPSE on our hike out! We would stop every couple minutes, put on our eclipse glasses, and watch the moon slowly make its way down to cover more and more of the sun. By the time we reached our car the world had gone eerily dark. Talk about a once in a lifetime experience!